The Archaeological museum was built in 1900 and is located alongside to the town’s commercial harbour. 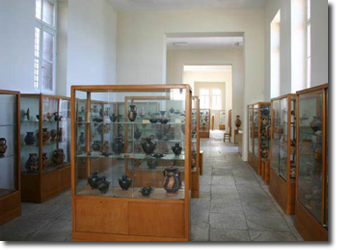 It contains 5 small rooms with vases of 2,500 to 4,500 years old, collections of 1st and 2nd century B.C. grand stones, funerary jewellery from Rhenia (the cemetery island of Delos), a statue of Hercules done in Parian marble, large 7th century B.C. jar with Trojan War reliefs on it and blackened bronze kouros handoff a 6th century saucer, Roman carvings and bronze vessels. 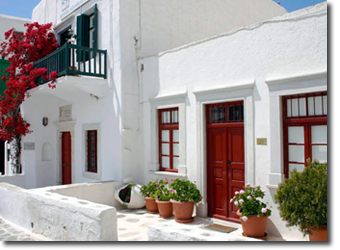 The Folklore Museum is located in an old two-story captain’s house in the Kastro area of Mykonos Town, a few meters distant from the proud Paraportiani church. Established in 1959 by professor Kyriazopoulos’s family, the museum is housed in a private building of the 18th century. There are six main exhibition halls which house collections of antique furniture, Byzantine icons, Folkloric ceramics, historical commemorative plates, decorative prints and gravures, as well as embroidered and hard-woven fabrics, locks and keys, weights and measures, a lovely collection of model boats, and other historical artefacts. Open from 16:00 to 20:00 everyday and on Sunday from 17:00 to 20:00. The Agricultural Museum is located in the area Ano Myli in Mykonos Town. 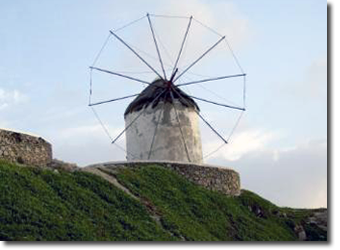 Dating from the 16th century and belonging to the Folklore Museum of the island, The large Bonis windmill, one of the finest in Greece, operates just as it did when first built. There is a collection of old agriculture tools and machinery. It presents the traditional Mykonian agricultural installation used for the production and processing of farm products, a traditional threshing-floor and a village style oven, the wine-press, a water wheel, a stone water tank, the miller’s house and two little twin churches. 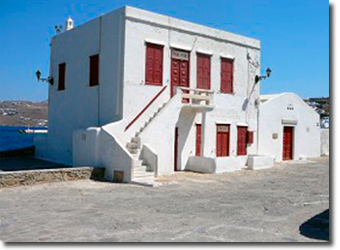 Lena’s house also a branch of the Folklore Museum, is located at the three wells “Tria Pigadia” area in Mykonos Town. An authentic 19th century middle class Mykonian house, that’s representing the typical internal arrangement of space. It contains a spacious drawing room, two bedrooms and two courtyards with an example of a dovecote. The rich antique furnishings, such as the large frames containing some splendid prints, tapestries, wood carvings, old mirrors, planted plants etc. 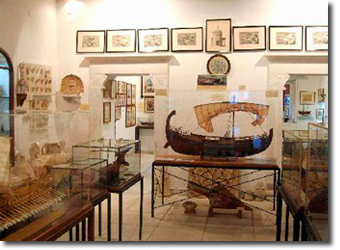 The Aegean Maritime Museum is located at the three wells “Tria Pigadia” area in Mykonos Town, next to Lena’s house. The Aegean Maritime museum is built in the 19th century and founded in 1983 by the ship-owner George. 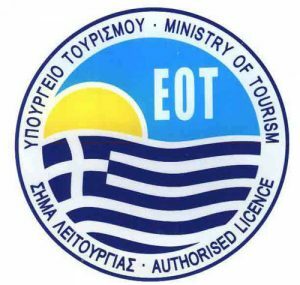 N. Drakopoulos who in 1985 for the first time opened its doors to the public, and had been honoured for the foundation of the Museum with the Athens Academy Award and with the World Ship Trust’s Award for Individual Achievement. The museum has inside & outside in the garden exhibits. Inside are models of ships from the pre-Minoan period down to the 19th century, historical shipping documents, rare engravings and maps, ancient artifacts, navigational instruments, equipment and tools as well as a collection of rare ancient coins with nautical subjects from the 5th century BC to the 5th century AD. The museum’s library consists of more than 5,000 volumes of rare books and more recent editions, and archives of manuscripts and photographs, and is constantly updated to include additional archival material and new scholarship in relevant subjects. Outside one can see marble copies of gravestone reliefs of Delos and Mykonos dealing with shipwrecks and sailors lost at sea, old anchors and various nautical objects.